Manufacturing CNC Swiss Turned, Custom Milled and Swiss Screw machined plastic parts requires competence with varied plastic materials. Our years of experience with parts manufacturing have allowed us to fine-tune the production process behind a continually growing variety of processes and materials. Different plastics are better for different applications and manufacturing processes. Its important to take note of this when both choosing your materiel and who you choose to machine your part. If you already know what kind of material you need for your part, that’s great! Send us a request for a quote today and we can start of the process of getting you a finished product! If you don't have your material set, or even need assistance in tweaking your print or part designs feel free to contact us with our question form and our engineers can give you their advice as we work towards your goals together! Plastic is one of the greatest man-made materials in the world when it comes to making custom plastic products. 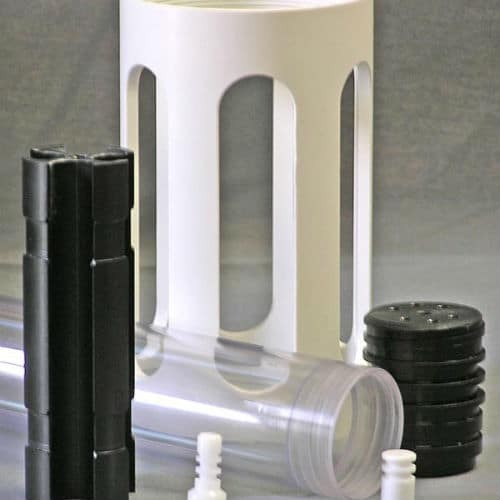 There are many different types of plastic focusing on a variety of different traits like PEEK or Delrin for load strength, or Teflon for resistance to chemicals. This makes the applications for plastic practically limitless! One of the other strengths of plastic is the price. Along to it being lighter, its normally cheaper to use than many of its comparable metals. Do you think you think plastic could work for your custom part? Send in a free request for quote with our easy to use online form and discuss it with one of our engineers or sales representative! We are committed to providing cost effective solutions with top quality and maintain AS9100 & ISO 9001:2015 certification, & ITAR Registration. Forster Tool takes great pride in the certifications we hold. We were one of the first machine shops in northern Illinois to become AS9100 Rev. 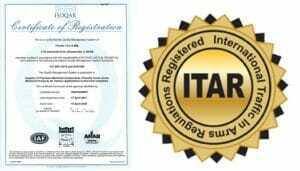 D certified, and quickly there after became an ITAR registered company. We adhere to the strict standards and regulations because we know it helps to produce a better, high quality end product for you. Forster Tool doesn't take short cuts when it comes to quality and we do not settle for anything less than the best. Forster Tool is more than willing to look into further certification or registration with governing bodies to fit needs specific for you part as well because above all else, we are always looking to satisfy our customers. For more information about our quality system and Forster Tool, you can visit our Quality page or contact us through our question form. If you would prefer to talk us, someones always there to take your call to at 630-616-8177. Our Request for Quote page is available 24/7 here, one of our sales representatives will get back to you during business hours as soon as they can. From everyone at Forster Tool, we look forward to hearing from you! and let Forster Tool answer your questions about machined plastic parts. custom plastic parts, custom plastic machining, plastic parts, custom made plastic parts, plastic machining, plastic screws, plastic fasteners, plastic components, swiss screw plastic parts, milled plastic parts, turned plastic parts.